Marzipan, a delicate mixture of ground-up almonds, rosewater and a bit of sugar, originated in the Orient more than 1,000 years. Served at the tables of caliphs and noblemen, marzipan was a prized dessert. During the Crusades, European tradesmen brought the specialty to medieval trading hubs in Italy, Spain, Portugal and the Hansa League city of Lübeck. Over the following centuries, Lübeck became the marzipan capital of the world, with its own quality standards for this delicious treat. When Johann Georg Niederegger, a trained confectioner, purchased a pastry shop in Lübeck in the year 1806, he probably did not imagine that his name would become the world’s most recognized brand for marzipan two hundred years later. 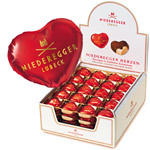 The secret of the Niederegger’s success has to do with the exact ratio of ground up almonds to sugar and with an ingredient similar to rosewater. 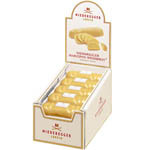 As most culinary experts agree, Niederegger marzipan is of the finest quality standard, made from 100% almond paste. 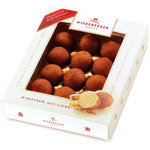 (Many other manufacturers of marzipan offset the cost of almonds by adding more sugar or almond extract to the mixture). 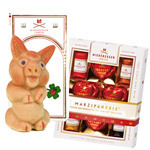 Today, a growing fan base throughout the world enjoys Niederegger marzipan specialties such as pralines, chocolate-covered marzipan bars, white marzipan paste and hand-crafted marzipan pigs. These items can be found at many high-end restaurants or specialty retail stores and are used as ingredients in cakes, dessert items or as gifts for many occasions. 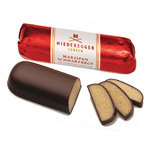 Besides marzipan, Niederegger also offers nougat pralines (made from hazelnuts). 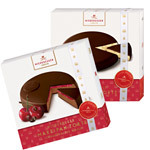 While marzipan consumption is highest during Christmas and Easter, Niederegger treats are enjoyed year round by aficionados of high end confectionary. Chocolate covered marzipan treats for Valentines Day, Mother’s Day, Birthdays or for any loving moment. This is pure 100% marzipan paste (70% almonds, 30% sugar) covered with bittersweet chocolate in the classic shape. Comes in 1.6 oz, 2.6 oz, 4.4 oz, 7.0oz and 10.5 oz sizes. Delicious snack enjoyment for on-the-go. 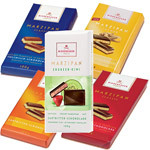 Pure marzipan in dark chocolate, milk chocolate, or walnut rum brittle flavors. 40g/1.4 oz. per stick. 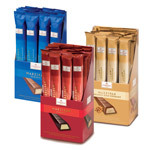 Classic chocolate bars, filled with pure marzipan, covered with dark chocolate or milk chocolate. Other varieties include Orange, Ginger, and Raspberry. 3.5 oz. 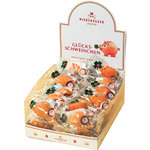 Seasonal marzipan items from Niederegger make great stocking stuffers and gifts during Advent and Christmas. 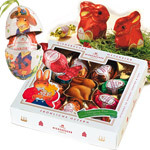 Easter assortments of marzipan Easter eggs, marzipan Easter bunnies, and other seasonal variations covered in chocolate or without. 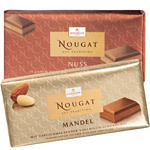 High quality nougat bars in almond and walnut flavors covered with milk chocolate. 3.5 oz. 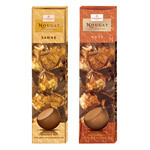 Light chocolate balls filled with intense creamy nougat flavors. A treat for nougat lovers. 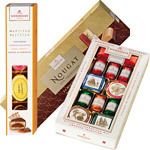 Great gift packs or desserts with a variety of marzipan shapes, like bars, hearts, pralines, and fruit-filled marzipan pies as well as flavors like espresso, pistachio, pineapple, orange and more. These marzipan pigs are regarded as symbols of luck and given on New Year’s Eve, graduations or other festive occasions. Hand-painted marzipan treats made from the best quality 100% marzipan paste. Available in various shapes such as potatoes, apples, pears and oranges. A marzipan cake covered entirely with bittersweet chocolate, for birthdays or after dinner desserts. Also available in Black Forest Torte. 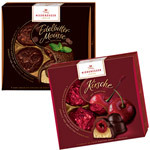 Mouthwatering marzipan cherry pralines and dark chocolate mousse pralines, an irresistible composition of fine Niederegger artistry. Pure 100% marzipan paste for baking, snacking or as decoration. Malleable, shapeable into different forms.